The clock in my possession is a mantle clock given as a wedding present to my grandfather on the occassion of his marriage from his employers in Scotland in 1903, and so inscribed on a brass plaque beneath the dial. The back of the works casing is stamped, D.C.Co within an oval above the main stamping. The main stamping is marked, Meddille D'Or Paris 1900 enclosed within a circle. Within the circle is enscribed "F.Marti" in script font, and below the main stamping is marked "52". The face of the clock is marked in Arabic (?) numerals. 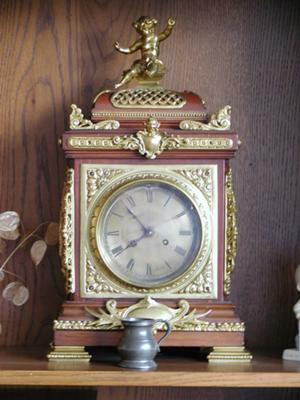 The side panels are of open brass work and the top of the clock is adorned with a brass cherub. All brass work is very ornate, and the actual case is of dark wood, perhaps mahogony. Overall I'd say that it stands about 18 inches tall. Could you provide information on the clock, and an approximate value? 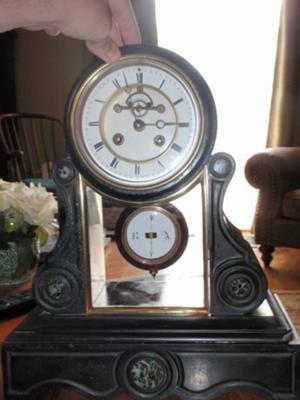 This beautiful clock measures 15"x15"x6" and has a movement marked L.E.P. Japy & Cie Medailles. On the back left foot is stamped JOUY and the number 65. Any information provided would be greatly appreciated. The clock in my possesion is a mantle clock given as a wedding gift to my grandfather on the occasion of his marriage from his employer in Scotland in 1903, and so marked by a brass plaque beneath the dial. The back of the casement is stamped, D.C.Co within an oval above the main stamping. The main stamping is marked, Meddaille D'Or Paris 1900 enclosed with in a circle. Within the circle is ensribed "F.Marti" in script font, and below the main stamping is marked "52". The face of the clock is marked in Arabic numerals. 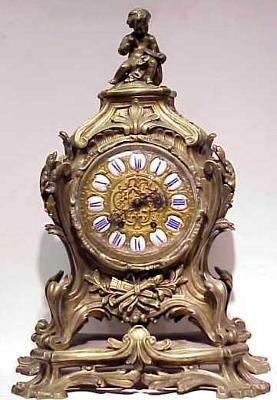 The side panels are of open brass filigre and the top of the clock is adorned with a brass cherub. All brass work is very ornate, and the actual case is of dark wood. Overall I would say that it stands about 18 inches tall. Could you please provide information on the clock, and an approximate value? I have been trying to identify a wall clock I got when my grandfather passed away. He received the clock from my great great aunt. 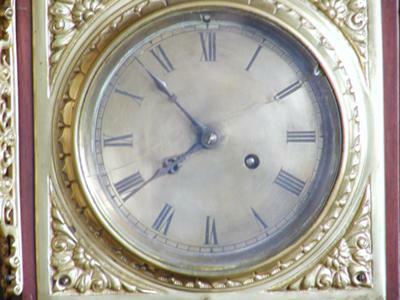 The dial of the clock has both Roman numerals and numbers at every five minute mark. 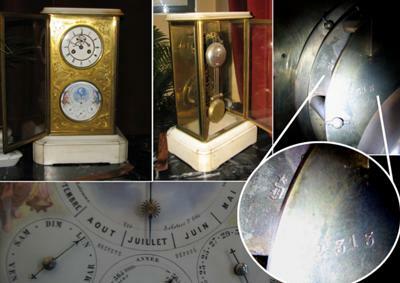 On the dial above the arms says "Jean Le Mire" and below the dials says "A Paris". When you open up the back there is a small circular imprint that I beleive says "Medaille D'Or paril 1900" also in the center of that I beleive it says "Samuel Marti"
Found this clock at a local antique store. It needs a lot of "bodywork". The marble pieces on the ends of the base are badly broken and there is a deep chip on the edge of the glass at about 1 minute past 12. The seller says it needs a new spring also. The stamp on the movement reads "Medaille de Bronze" and "S. Marti et Cie". Also stamped on the movement are the numbers 4461 and 45. From the hours I have spent on the internet, I think that dates it to 1860's or 1870's. I can't find a photo of another clock like it. Almost all of the French marble mantel clocks I see are black marble. With the spring problem, it's not running, so I can't even hear it chime. Can someone please help me to identify this diamond in the rough? (well, maybe not a diamond, but I like it) :) Possible value? Worth repairing? Thanks in advance for your expertise and help for a total novice. This clock was given as partial payment to my uncle for services. They know it is turn of the century. The time piece is Le Roy Et Fils which we know is different from the actual maker. There is not a nick, scratch or crack anywhere on the clock. It's very heavy. The time piece still works and has the key. There is no longer a sticker on the bottom though. We would like to know who the maker was for the figure. If anyone has ideas, please let me know. We just received this black marble clock and I have tried to find out more about it from local clock experts and have been told not to bother and brushed aside because I can't seem to find a visible marking. However, it is a longtime family piece and I would love to know anything about it.. even if its only worth 20 dollars! Hello! I have just inherited one of the items left from generation to generation in my family. 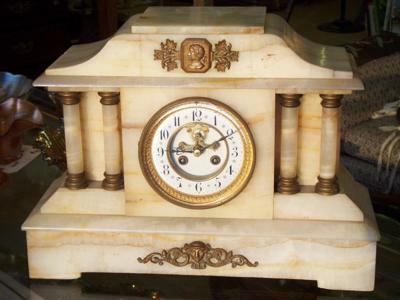 It is a gorgeous bracket clock, bronze and white marble. I have been trying to identify the maker and the making date for some time now, but didn't actually succeded in finding out much. I believe it to be a Delettrez or a Brocot and Delettrez, dated somewhere between 1860 and 1880...but I cannot tell for sure. Does anybody know what the star and the D marking stands for? Found this clock in a local auction. It is a time keeper only (no chimes). Clock repair had never seen works like this before. By searching the internet have found that two different trademarks were used by the Japy family. All the newer clocks have serial number and the more elaborate Trademark with the name Japy and are chimed. Seldom have I found a clock with the same trademark nor a Japy clock without chimes. Those that do, the owners have no idea of the age. If Frederic Japy (Grandfather about 1750's to 1810) was responsible for the manufacture of thousands of clocks, where are they? 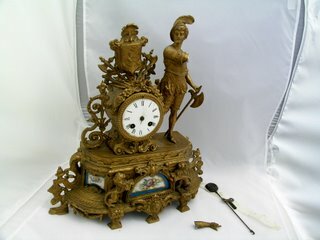 It is one of the few clocks existing in the world signed by this sculptor (François Clément Moreau, 1831-1865). The piece is in great condition and no damage has been noticed (exclude small breaks on marble on the left corner that were restored, see the picture). The clock is running very well, the movement was recently disassembled by parts, cleaned, oiled, and tested properly by myself (I am a clock master with 20 years experience from clock masters dynasty). 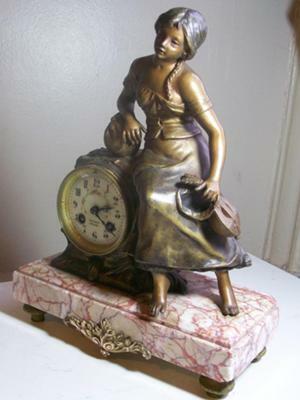 The body of the clock is made from bronze with brown patina; the sculpture of the young woman is from bronze. The clock is chiming nicely on the half-hour and each hour (8 days works). Dimensions: high – 13 ¾ in (35 cm), long – 10 ¾ in (27.5 cm), wide – 4 ¾ in (12 cm). Francois Moreau was a French master who created beautiful bronze works during his short-lived career. Most known today are: "A youth with a bee" (was sold at Sotheby's in Amsterdam September 29, 2008), "Allégorie de la musique" (from Cannes de collections), "Figure Of A Fisherboy" (private collection), "Les victoires de l'aviation" (private collection). The dial is signed by GAILLARD A POITIER, a master from Poitiers - a capital of Vienne province on West France (180 miles from Paris), a city with rich battles and industry history, Roman ruins, second oldest University of France. (Peintre sur émail. Mentionné à Genève en 1857. “Painter on enamel. Mentioned in Geneva in 1857”. “JS”: Balancier Mechanism Japy Frères et Cie "medal of honor 'Marking on the mechanism: left B Aureville, Lallier, patented SGDG 1230 bottom Japy Brothers and Co. 64. Bronze marking within the pendulum 56, JC. This is sign of Japy Freres et Cie, clock and watch factory, Beaucort France. Japy Freres is the founder of the Japy industrial dynasty. Fredric Japy 1749-1812 was a watchmaker and inventor of fixtures and machinery for the clock/watch making trade. The Japy Company held the top rank as a leading enterprise in the clock and watch making industry. Adolph Japy was very influential for the industrialized development for mass produced clocks/watches. A foundry, machine factory, produced also hardware. Adolph Japy, knighted and member of the French Legion of Honour was for several terms the major of the city of Beaucort, held many public offices, died in Paris 1897. The Japy clock movements are regarded of best French original clock making (quoting Karl Kochmann). 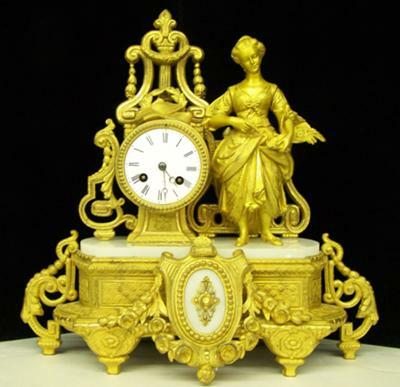 Due to massive production in the 19th century, a good number of Japy Freres antique mantle clocks and French Garniture set (mantel clock and candelabra set) can be seen not only in museums but also in private houses. They are also openly available in auction and antique houses and auction sites. History started as early as 1777 when Frederick Japy began making clocks in his factory in the region of La Franche-Compte. Soon, the lone clock-maker established the clock-making company under his name in 1806. Together with his three sons they run the first ever rough watch movement factory in France. The family supplied raw movements or “ebauche” (incomplete watch movement) to some of the France’s notable craftsmen of his time. The company also supplied ebauches to Swiss watchmakers. This trademark was registered in 1887. If you look at it closely you can see the stylized JFC (use a little imagination). Frederic Japy was born in 1749 in Beaumont, France in the Franche-Comte region. This area is in eastern France and has Alsace to the north, Burgundy to the west, and has a long, 143-mile border with Switzerland. Japy was long interested in the clock-making industry in the Jura Mountains, and he began his career apprenticed to a Swiss clock maker. Eventually, he moved on to work with the inventor Jean-Jacques Jeanneret-Gris. It was this latter relationship that allowed Japy to invent his own machine tools, which over the years led to the mechanization of the clock-making industry in France. Japy established the first factory to make rough watch movements in Beaumont in 1777. By 1780 he had more than 2,000 patterns and by 1806, that number had grown to almost 13,000. In 1806 he established Japy Freres with his three sons who continued to run the business after their father's death in 1812.
known as Japy Freres) is one of the most famous collectible antique French clocks today. 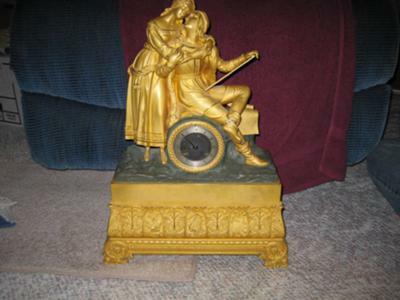 All I know of this clock is that it is a family property since the 1800's, it is L&F Moreau french table clock, in the pictures some numbers can be seen, is it enough to accurately date the clock? Is there a data base to check it out? Is there a market for it? The clock is in working condition, what could be the market value for it? I'll really appreciate any information about it, thanks. 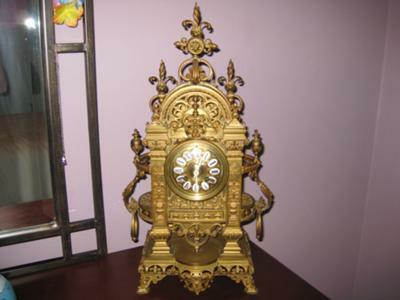 This is a french clock serviced by a local clock co. in Salt Lake City, UT. The bronze is signed by L.F. Moreau on the side. In the front there is a small sign that has "Charmeur" on the first line then underneath it says "Par Francois Moreau". It is in great condition. I tried to look up some info on the internet. I found some info, however I am wondering about this particular clock. 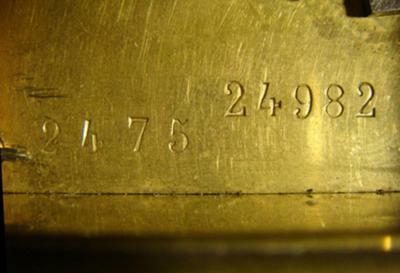 Inside it is numbered on the brass(60731). It also has the initials J.S. (Made in France) with a two number 4's under that. Any info would be welcome. We also inherited another one I will list later. 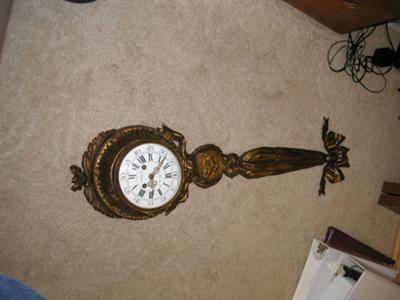 When I was a child, there was an old pendulum clock my grandmother had hanging in her kitchen. The sound of any clock ticking back and forth always reminds me of grandma's place. Surprisingly, the clock has survived all these years and was recently discovered in my now deceased father's barn. My brother has taken it to a clock repairman and the clock is running again. We always assumed that it was a train station clock because my grandfather was an engineer on the Louisville & Nashville RR. 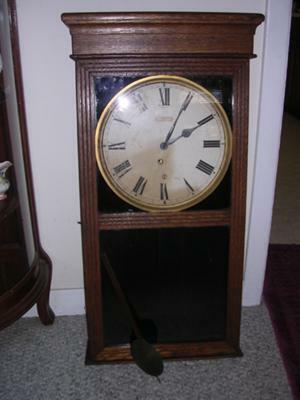 But, I saw a post of yours describing a similar clock that said it might have been an inexpensive version of a regulator clock, and it might have had an advertisement in the lower glass. It makes sense since there is only one mechanism to wind. It says "Made in USA" on the face and there is a trademark symbol at the bottom that looks like a circle with a large "S" with an "E" on top and a "J" at the bottom. Thanks for any information you can relate. 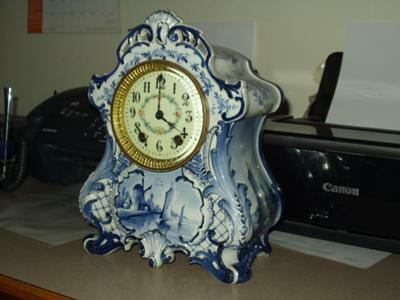 I have what I believe is a porcelain or china shelf clock that says "Made in France 247" on the back of it. I also know it is a Gilbert clock face since it states the manufacturer on the back on the clock itself. Pendulum type, chime and an 8-hour with 3 key slots in the front. The clock does not work and I do not have the key or keys for it. I was wondering about the value of this so I could decide if it was worth getting fixed and who the manufacturer was. It has a blue delft look to it with a windmill and sailboats on the front and a sailboat again on the sides. Wooden bottom. Brass back opening to access the clock workings. Flower faced clock. I have recently been given a clock that originally belonged to my grandfather. I believe he acquired it in the 1940's. I think the clock dates older than that. I can't find any markings, but my brother told me that my grandfather had it apart and thought there was an 1800's date on the inside. I'm not adventerous enough to try and take it apart myself. It's very heavy and I believe it's made from bronze. Do you have any idea of the maker, country of origin, and/or the approximate year it was made? I am also curious on an approximate value. 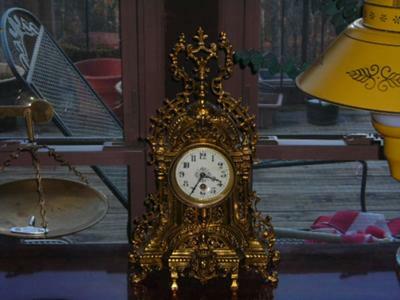 I have bought recently this "ormolu" clock which I have been told that has Sevres plaques, however it needs restoration and repair. Before doing that I would like to get more information. Would you know more about this clock? Any assistance more that welcome. This French clock has the mark "CHLESMT with the number 11881 stamped beneath it. (the 'LES' and the 'T' are actually smaller font and in superscript, but I can't show that in this page format) The mark is on the lower right corner of the plate covering the movement. Someone thought perhaps the "CH" part of the mark indicated the movement was made in Switzerland near the French border. The cherub at the top is holding a sundial. The clock is approx. 20" tall. Mostly brass. Can anyone give me more info about this clock and/or the mark?? ?